When you need a better garage, you can count on Custom Garage Works! 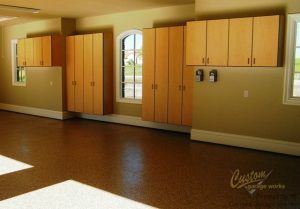 In 2003, we began providing high quality garage floor coating in Palmer, TX after we needed more out of our own garages. While we were unable to locate the services we wanted within the industry, we did not let that stop us, but instead, we made the decision to join the industry ourselves. We now offer our clients some of the best custom garage solutions available, including high quality cabinets and incredibly durable floor coatings that out-preform epoxy coatings. Our team is professional trained, and we are passionate about creating custom garages, with impressive garage floor coating results across DFW. 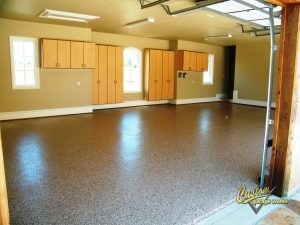 One of our most common garage options is our garage floor coating in Palmer, TX. This is because by using polyaspartic coatings in lieu of epoxy, we create a finish that lasts longer and is more durable. Thanks to it’s tough composition, our polyurea-based floor coating is resistant to yellowing and failing that can occur with epoxy. And thanks to our use of a diamond grinder instead of risky acid etching for floor prep, we can ensure a greater amount of adhesion, which leads to a quality installation. If you’re looking to learn more about our professional garage floor coating services, give us a call at 214-494-9068 or 817-308-1305 and schedule your free estimate! When you are running out of space in your garage, Custom Garage Works has the perfect garage storage and organization solution for you! Your garage looks best when it is clean and organized. We offer a variety of solutions to sort your belongings, including overhead storage racks and garage cabinets. Designed specifically for garage use, our garage cabinets are among the best in the industry, and our storage racks are designed for high capacity storage. We are committed to helping our clients get the perfect garage floor coating and organization for their needs and budget, and we look forward to assisting you! And More! Do not be worried by clutter in your garage any longer. We have the organization solutions you need!